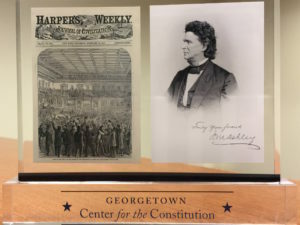 There are many ways to give to the Georgetown Center for the Constitution. You can make an online gift to the Center through our fast, easy, and secure system. 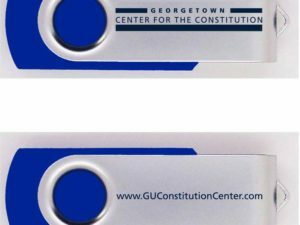 On the online form, you can direct your gift directly to the Georgetown Center for the Constitution. You may designate your gift to the Center by writing “Georgetown Center for the Constitution” on the Memo line of your check. As a thank you for your gift of $100, the Center will send you this customized thumb drive, which includes the recent scholarship of Professors Randy Barnett and Lawrence Solum. As a thank you for your gift of $500, the Center will send you our thumb drive and a memento of your choice (either a signed photograph of Chief Justice Salmon P. Chase and a copy of a Harper's Weekly cover, or James Madison's Notes for his Bill of Rights speech delivered on June 8, 1789). 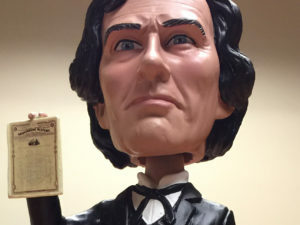 As a thank you for your gift of $1000, the Center will send you our thumb drive, a memento of your choice and a bobblehead of your choice (James Madison, Salmon Chase or Thaddeus Stevens).